Workers replace lead service lines in Washington, D.C. in July 2008. High lead levels in the drinking water of the nation’s capital found starting in 2001 prompted the D.C. Water and Sewer Authority to replace lead pipes. It also prompted the U.S. Environmental Protection Agency to revise its lead regulations, a process that is still ongoing. In December, just before the long holiday season, the National Drinking Water Advisory Council submitted to the U.S. Environmental Protection Agency a 49-page report with recommendations for updating federal drinking water regulations to address lead contamination. Acting on the advice of an expert working group, the council told the EPA that the current lead rules, established in 1991 with subsequent minor revisions, are too weak. The council argued that the country must act with greater resolve and ambition to protect the health and well being of its most vulnerable citizens. Instead of fiddling with water chemistry to reduce corrosiveness, as is now the first course of action for a city with high lead levels, agencies at all levels of government should strike at the heart of the problem and eliminate lead service lines, which are the source of pollution. Moving to eliminate lead service lines would be a bold step. Obama administration proposals to strengthen federal environmental regulation — the Clean Water Rule for clarifying the Clean Water Act, the Clean Power Plan to cut carbon emissions, and rules to reduce methane emissions and coal mining on public lands — have been met with fierce opposition and lawsuits, mostly from Republican attorneys general, representatives in Congress, and industry groups. Yet, there is also no more favorable time for the EPA to be bold on lead. The country is watching with revulsion at the outrageous failure of government that led to the poisoning of drinking water supplies for 100,000 people in Flint, Michigan. For more than a decade the EPA has been reviewing the Lead and Copper Rule, the 1991 statute that guides how utilities should respond to lead contamination. NDWAC’s recommendations are the final high-level submission before the EPA issues a draft rule, expected next year. The council’s position is clear: the country, as a whole, must do more to address lead. Achieving that goal requires teamwork: not only the involvement of the EPA but also of state and local governments, water utilities, and their customers: a “comprehensive collaborative national effort to reduce lead in drinking water,” according to Jill Jonas, chair of the National Drinking Water Advisory Council (NDWAC). Before Flint, there was Washington, D.C. In 2001, household drinking water tests in the American University Park neighborhood began showing high lead levels. Two years later, when the D.C. Water and Sewer Authority expanded testing, the scale of the problem began to emerge. Two-thirds of the 6,118 homes tested in the fall of 2003 had lead levels above federal thresholds that would trigger corrective measures. Washington, D.C. embarked on a $US 408 million lead service line replacement program after finding high lead levels in drinking water between 2001 and 2004. Lead in the drinking water in the nation’s capital struck a nerve. Investigations by the Washington Post revealed problems similar to Flint: utility officials more concerned about controlling costs than being cautious and public leaders who knew about the problems yet stayed silent. The D.C. Council held 11 oversight hearings and Congress held four. In response, the EPA determined that the Lead and Copper Rule ought to be reviewed and made more effective. The Lead and Copper Rule has many deficiencies, according to experts. First, the rule does not protect everyone. Lead typically enters drinking water from service lines, which extend from the main distribution pipe to the house. Most utilities are required to test water at the faucet for a four-month period once every three years. Changes or spikes in lead concentrations during the other 32 months are not monitored. Apartment buildings are not required to be monitored at all under the current rule. If more than 10 percent of the samples in a city show lead levels above 15 parts per billion, known as the “action level,” then the utility must take corrective measures, outlined below. If fewer than 10 percent of the samples are above the action level, the utility, if it serves fewer than 50,000 people, is not required to take any action, even though certain households may have dangerously high lead levels. Second, the rule focuses on manipulating water chemistry to prevent lead from leaching into water supplies. Utilities that serve more than 50,000 people are required to do “corrosion control” to keep lead from leaching into the water. This means changing the water’s pH or adding orthophosphates or silicates, which coat the inside of pipes. Flint officials did not undertake corrosion control measures when they switched from Detroit’s water system to the Flint River. A third problem is partial lead service line replacement. If corrosion control does not reduce lead levels, the utility required to replace lead service lines. There is a catch. They are required to replace only the part of the line that they own, often the segment from the main distribution line to the meter. The homeowner is responsible for the portion from the meter into the house. Partial replacements are problematic. According to a 2011 study from the EPA Science Advisory Board, partial replacement cause lead levels to increase in drinking water, not decrease. Those results were confirmed by a Virginia Tech study published earlier this month. Digging up old lines disturbs the ground and may shake loose lead in the pipes that remain in the ground. If the replacement pipe is copper, the corrosion rate increases as well. Yet partial replacements are common. 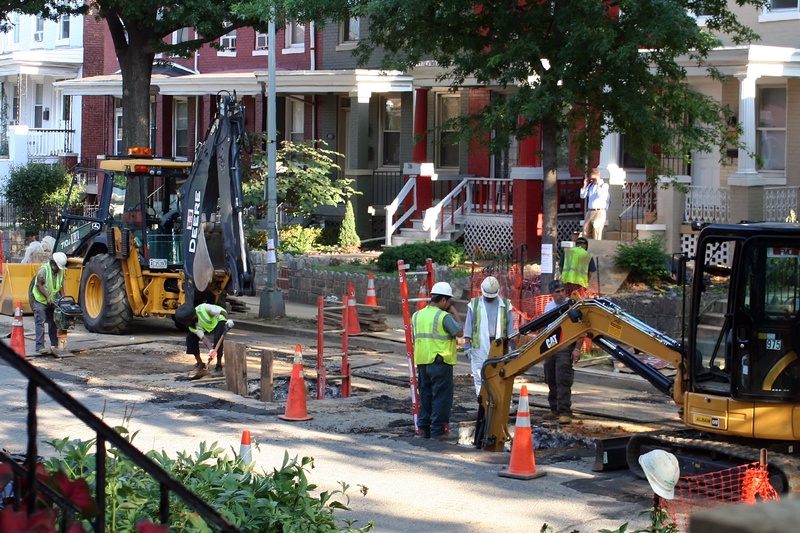 When D.C. Water and Sewer Authority embarked in 2004 on a $US 408 million program to remove lead service lines, only one out of seven homeowners during the first round of replacements choose to replace their segment of the line. Lead pipes are widespread in the United States but concentrated in the Midwest, Deep South, and New England. There were 10.5 million lead service lines in the United States in 1988, three years before the Lead and Copper Rule went into effect, according to the EPA. There are approximately 7.3 million lead service lines still in use. Replacing all lines would costs billions of dollars, Mehan said. NDWAC did not calculate the cost of its recommendation, but full lead service line replacements can be completed for as little as $US 1,000 per line, according to Neltner. Other estimates are as high as $US 8,000 per line. Stronger attention to compliance and enforcement. Other suggestions for addressing lead involve local or state agencies. Replacing lead service lines could be a mandated part of real estate transactions, and the cost could be incorporated into a 30-year mortgage. “It’s really an outside-the-box idea,” Derrick Dennis, water quality manager for the Washington State Department of Health and a member of the lead working group, told Circle of Blue. “To phase out lead service lines will take a broader societal effort,” Mehan said, noting that the EPA probably does not have the legal authority to force utilities to pay for replacing lead lines on private property. A first step, Mehan mused, will be an accurate inventory of lead service lines. Then, a plan for financing the replacement. A full turnover will take decades, he said. Cost is always an objection to new regulations, Neltner said. But in the case of lead, a longer view is required. Neltner is optimistic that a stronger rule will emerge. EPA officials were in the room when the working group held its meetings. “EPA staff were enthusiastic about the results of the working group,” he said. The EPA press office had little to say about the NDWAC report. Lee did not respond to a request to interview the officials who participated in the working group meetings. Lee did note that the EPA expects to publish a draft rule in 2017, nearly 13 years after the agency began its review.